I read Widescreen Review for at least three good reasons: 1), Reviews of new, interesting components are uniquely personal and effective. A fine example is the recent piece on the Plinius multichannel amp. 2), I am an early adopter who wants to know about things like Blu-ray and HD DVD. 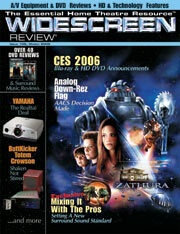 Widescreen Review covers HDTV issues like no other publication. I cannot find this information anywhere else. 3), I consider Joe Kane to be the video display guru par excellence. I have had my 65 inch Mitsubishi RPTV calibrated twice by a technician here. He first calibrated it after I bought it and then after a move. He does a great job. He follows Mr. Kane's arguments in WSR, and we usually discuss his latest manifesto. We trust him, and really agree with him about moving from interlaced to progressive displays of film and video. If you are an enthusiast in this field, and certainly if you are a professional, you have to be conversant with the problems and opportunities covered in Widescreen Review. The smartest thing you could do is pick one up regularly.